Update 1902 for Configuration Manager current branch is available as an in-console update. Apply this update on sites that run version 1802, 1806, or 1810. When installing a new site, it's also available as a baseline version. This article summarizes the changes and new features in Configuration Manager, version 1902. Always review the latest checklist for installing this update. For more information, see Checklist for installing update 1902. After you update a site, also review the Post-update checklist. To take full advantage of new Configuration Manager features, after you update the site, also update clients to the latest version. While new functionality appears in the Configuration Manager console when you update the site and console, the complete scenario isn't functional until the client version is also the latest. The implementation for sharing content from Azure has changed. Use a content-enabled cloud management gateway by enabling the option to Allow CMG to function as a cloud distribution point and serve content from Azure storage. You won't be able to create a traditional cloud distribution point in the future. Linux and UNIX as a client. Deprecation was announced with version 1802. Consider Microsoft Azure Management for managing Linux servers. Azure solutions have extensive Linux support that in most cases exceed Configuration Manager functionality, including end-to-end patch management for Linux. Multiple rules with recommendations on managing collections. Use these insights to simplify management and improve performance. Review these new rules in the Collections group. Update clients to a supported Windows 10 version rule in the Simplified Management group. This rule reports on clients that are running a version of Windows 10 that's no longer supported. It also includes clients with a Windows 10 version that's near end of service (three months). You can now enable enhanced HTTP per primary site or for the central administration site. On the properties of the central administration site, select the option to Use Configuration Manager-generated certificates for HTTP site systems. This setting only applies to site system roles in the central administration site. It isn't a global setting for the hierarchy. Pending system restart on the remote SQL Server: This prerequisite check is similar to the Pending system restart rule, but it checks a remote SQL Server. For more information, see List of prerequisite checks. Configuration Manager can now stop a cloud management gateway (CMG) service when the total data transfer goes over your limit. The CMG has always had alerts to trigger notifications when the usage reached warning or critical levels. To help reduce any unexpected Azure costs because of a spike in usage, this new option turns off the cloud service. Set up outbound traffic alerts on the CMG, and then enable the option to Stop this service when it exceeds the critical threshold. Starting in version 1810, the classic service deployment in Azure was deprecated for use in Configuration Manager. That version is the last to support creation of these Azure deployments. Existing deployments continue to work. Starting in this current branch version, Azure Resource Manager is the only deployment mechanism for new instances of the cloud management gateway and cloud distribution point. You can now associate a cloud management gateway (CMG) with a boundary group. This configuration allows clients to default or fallback to the CMG for client communication according to boundary group relationships. This behavior is especially useful in branch office and VPN scenarios. You can direct client traffic away from expensive and slow WAN links to instead use faster internet links to Microsoft Azure. [Updated] Configuration Manager now supports running CMPivot from the central administration site in a hierarchy. The primary site still handles the communication to the client. When running CMPivot from the central administration site, it communicates with the primary site over the high-speed message subscription channel. This communication doesn't rely upon standard SQL replication between sites. For more information, see CMPivot for real-time data. The task sequence sets a timestamp when it puts the client in provisioning mode. A client in provisioning mode checks every 60 minutes the duration of time since the timestamp. If it's been in provisioning mode for more than 48 hours, the client automatically exits provisioning mode and restarts its process. [Updated] When connecting to a client with two or more monitors, it can be difficult to view them all in the Configuration Manager remote control viewer. A remote tools operator can now choose between seeing All screens or the First screen only. For more information, see How to remotely administer a Windows client computer. You can now specify a custom port number for wake-up proxy. In client settings, in the Power Management group, configure the setting for Wake On LAN port number (UDP). This version has improvements to the feature to receive email notifications for application requests. Users could always add a comment to the request from Software Center. This comment shows on the application request in the Configuration Manager console. Now that comment also shows in the email. Including this comment in the email helps the approvers make a better decision to approve or deny the request. You now see a more detailed progress bar during a Windows 10 in-place upgrade task sequence. This bar shows the progress of Windows setup, which is otherwise silent during the task sequence. Users now have some visibility into the underlying progress. It helps with concerns that the upgrade process is suspended because of a lack of progress indication. This feature works with any supported version of Windows 10, and only with the in-place upgrade task sequence. This version includes several improvements to help you better create and manage task sequence media. When you create task sequence media, now customize the location that the site uses for temporary storage of data. This process can require much temporary drive space. This change gives you greater flexibility to choose where to store these temporary files. In the Create Task Sequence Media Wizard, specify a location for the Staging folder. By default this location is similar to the following path: %UserProfile%\AppData\Local\Temp. You can now add a label to task sequence media. This label helps you better identify the media after you create it. In the Create Task Sequence Media Wizard, specify a Media label. When you import an OS image, select the option to Extract a specific image index from the specified WIM file. Then select the image index from the list. When you apply software updates to an OS image, there's a new option to optimize the output by removing any superseded updates. The optimization to offline servicing only applies to images with a single index. When you create a schedule to update an OS image, select the option to Remove superseded updates after the image is updated. You can now directly enter Windows PowerShell code in this step. This change lets you run PowerShell commands during a task sequence without first creating and distributing a package with the script. To include the script parameters in the task sequence log, set the task sequence variable OSDLogPowerShellParameters to TRUE. By default, the parameters aren't in the log. Other improvements that provide similar functionality as the Run Command Line step. For example, specify alternate user credentials or specify a time-out. To take advantage of this new Configuration Manager feature, after you update the site, also update clients to the latest version. While new functionality appears in the Configuration Manager console when you update the site and console, the complete scenario isn't functional until the client version is also the latest. There's a new View default action on task sequences. The task sequence error dialog window now displays more information. It shows the name of the task sequence step that failed. In client settings, In the Computer Restart group, enable the following option: When a deployment requires a restart, show a dialog window to the user instead of a toast notification. With Software Center infrastructure improvements starting in version 1806, the application catalog site server roles are no longer required for most scenarios. Some customers still relied upon the application catalog to allow users to set their primary device for user device affinity. Now users can set their primary device in Software Center. This action makes them a primary user of the device in Configuration Manager. Specify these settings in the Software Center group of client settings. [Updated] Adjust the priority with which clients install a feature update through Windows 10 servicing. By default, clients now install feature updates with higher processing priority. Use client settings to configure this option. In the Software Updates group, configure the following setting: Specify thread priority for feature updates. [Updated] Use Configuration Manager to move Windows known folders to OneDrive for Business. These folders include Desktop, Documents, and Pictures. To simplify your Windows 10 upgrades, deploy these settings to Windows 7 clients before deploying a task sequence. First, find your Office 365 tenant ID. Then deploy the OneDrive sync client version 18.111.0603.0004 or later. For more information, see Deploy OneDrive apps by using System Center Configuration Manager. To create and deploy a OneDrive for Business profile, in the Configuration Manager console, go to the Assets and Compliance workspace. Expand Compliance Settings, and select the OneDrive for Business Profiles node. For more information, see the Redirect Windows known folders to OneDrive section in the OneDrive for Business Profiles article. 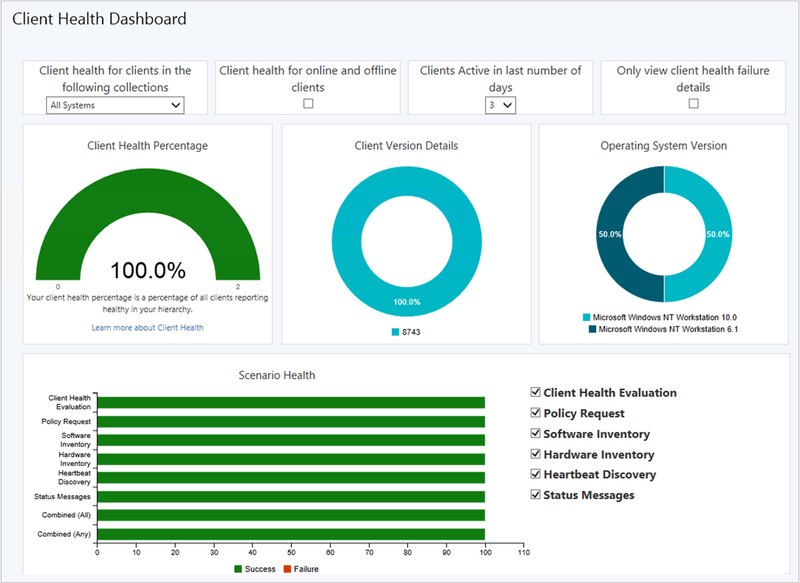 [Updated] Use Configuration Manager to identify devices with high confidence that are ready to upgrade to Office 365 ProPlus. The integration provides insights into any potential compatibility issues with Office add-ins and macros used in your environment. Then use Configuration Manager to deploy Office to ready devices. Configuration Manager now supports all supported languages for Office 365 client updates. The update workflow now separates the 38 languages for Windows Update from the numerous languages for Office 365 Client Update. Phased deployments now have their own dedicated monitoring node. This node makes it easier to identify phased deployments that you created and then navigate to the phased deployment monitoring view. In the Configuration Manager console, go to the Monitoring workspace, and select the Phased Deployments node. It shows the list of phased deployments. Specify additional criteria for the success of a phase in a phased deployment. Instead of only a percentage, this criteria can now also be the number of devices successfully deployed. This option is useful when the size of the collection is variable, and you have a specific number of devices to show success before moving to the next phase. Create a phased deployment for a task sequence, software update, or application. Then on the Settings page of the wizard, select the following option as the criteria for success of the first phase: Number of devices successfully deployed. This notification is a bar at the top of the console window below the ribbon. It replaces the previous experience when Configuration Manager updates are available. These in-console notifications still display critical information, but don't interfere with your work in the console. You can't dismiss critical notifications. The console displays all notifications in a new notification area of the title bar. [Updated] When you send feedback in the Configuration Manager console, it now shows a confirmation message. This message includes a Feedback ID, which you can give to Microsoft as a tracking identifier. For more information, see Product feedback. [Updated] You can now view the most recent connections for the Configuration Manager console. The view includes active connections and those consoles that recently connected. In the Configuration Manager console, go to the Administration workspace, expand Security, and select the Console Connections node. For more information, see Using the Configuration Manager console. There's a new Documentation node in the new Community workspace. This node includes up-to-date information about Configuration Manager documentation and support articles. You can now search for a MAC address in a device view of the Configuration Manager console. This property is useful for OS deployment administrators while troubleshooting PXE-based deployments. When you view a list of devices, add the MAC Address column to the view. Use the search field to add the MAC Address search criteria. To improve the accessibility features of the Configuration Manager console, update .NET to version 4.7 or later on the computer running the console. For more information, see Accessibility features in Configuration Manager. When you install or update a site server, it copies these installation files and supported language packs for the site to the Tools\ConsoleSetup subfolder. For more information, see Install the Configuration Manager console. Aside from new features, this release also includes additional changes such as bug fixes. For more information, see Summary of changes in Configuration Manager current branch, version 1902. For more information on changes to the Windows PowerShell cmdlets for Configuration Manager, see PowerShell version 1902 release notes. When you're ready to install this version, see Installing updates for Configuration Manager and Checklist for installing update 1902.